March 24, 2013 in "Canada"
Canada has ditched the penny. This made significant economic sense but made many customers in 'Dollarama' very angry. The issue was that Canadian's smallest currancy denomination now costs more to produce than it's actually worth. That, and it really shouldn't be named after the subdivision of the British pound when the Canadian dollar is divided into cents. And it's not even accepted by vending machines. In short, it was a bronze coloured abomination. 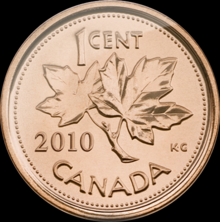 So in May 2012, the penny birth rate dropped to zero and last month the Royal Canadian Mint stopped distributing them, although they remain legal tender for anyone who was struggling to find ways to spend them. You might think that --in the face of there being no 1 cent coin-- all prices should be given in multiples of 5c. And you'd be right... except for the tax. Like the USA, Canadian prices are shown minus the sales tax, which in Ontario is a very unworkable 13%. Quite why prices are shown without the tax included remained a perpetual mystery to me during my time in North America. I rather thought that the point of a price tag was to tell customers how much they had to pay. But no. That idea was clearly ridiculous. … with the exception of the patrons at 'Dollarama'.